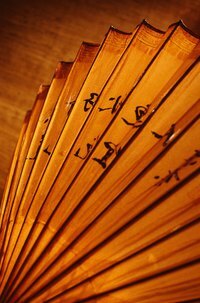 Wooden fans come in two basic designs. The simplest to make is a paddle fan, in which you cut out a pleasing shape of wood, typically round or oval, and attach a handle. For a folding, wooden fan, you'll need to cut wood into slats (or tines), drill holes and put it together with some hardware and ribbon. Cut the wood into 30 slats or tines. The actual dimensions are up to you as fans come in many sizes. However, for an estimate, consider making the tines between 10 and 12 inches long. The tines can be rectangular, having the same width from top to bottom, which would be the easier cut. Or, for a more beautiful tine, they can be tapered, being smaller at the base than the top. Make each tine approximately one inch at the widest. Taper to 1/2-inch if desired. Sand all cut edges until smooth. At the base of each tine, drill a small hole (the size of the pivot). At the top of each tine, cut two, parallel slots long enough for the width of the ribbon to pass through. Cut the slots in the middle of the tine. Stack the tines and thread the pivot through. At the back end, put on a washer then pound the end of the pivot to spread it over the washer. This locks the pivot in place. Now the tines can spread open like a fan, but they won't stay like a fan until we thread through the ribbon. Spread the tines so they are laying out like a fan. Start from the back side at one end and thread the ribbon through the tine's slots. The ribbon should thread up through the first slot to the top-side of the fan then back down through the second, parallel slot to the back side. Continue threading the ribbon through the next tine the same way. Continue this until reaching the last tine. Pull on the fan and ribbon until the fan is spread exactly as you want it and the ribbon is taut. Then cut off any excess ribbon. Flip the fan over so you can see the back side. Glue down both ends of ribbon to the outer tines. You do not have to glue the ribbon to each tine separately, just to the outer tines. Let it dry thoroughly.